The Klip is a simple, easy-to-use charger protector that takes a proactive approach to keep your Apple cords from fraying. 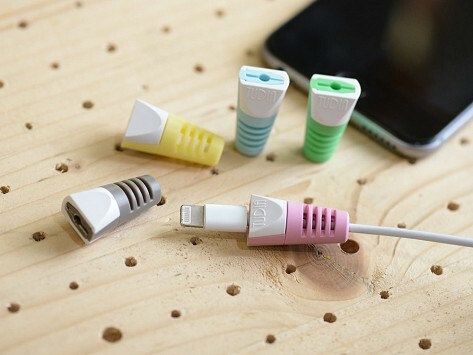 This small, lightweight set of clips slide onto each end of your charging cable, providing support at the connection points. Available in several colors, the Klip reduces strain by up to 80%, lengthens the life of your cord, and helps you easily identify it, too. Dimensions: 1.18" x 0.59" x 0.39"
These have served their purpose well. They really help to protect the cords from breaking. Gave to family and friends for charge cords. So far so good. You probably know the frustration of a frayed charging cable. The wiggling and partial charges are enough to make anyone crazy. The Klip by Tudia protects your Apple charger from fraying with two simple little cages around the cord’s stress points. The durable, silicone Klip slides easily onto the ends of your cable and snaps in place. It limits how much your cord can bend at the most stressful points, while still keeping it flexible. 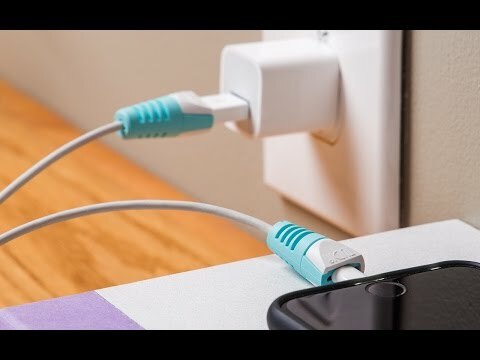 This reduces strain by up to 80% and increases the life of your charger. The Klip comes in a variety of colors to help organize your cables or just make yours easy to identify. So keep those expensive cables in great shape, as long as possible, with the Klip.